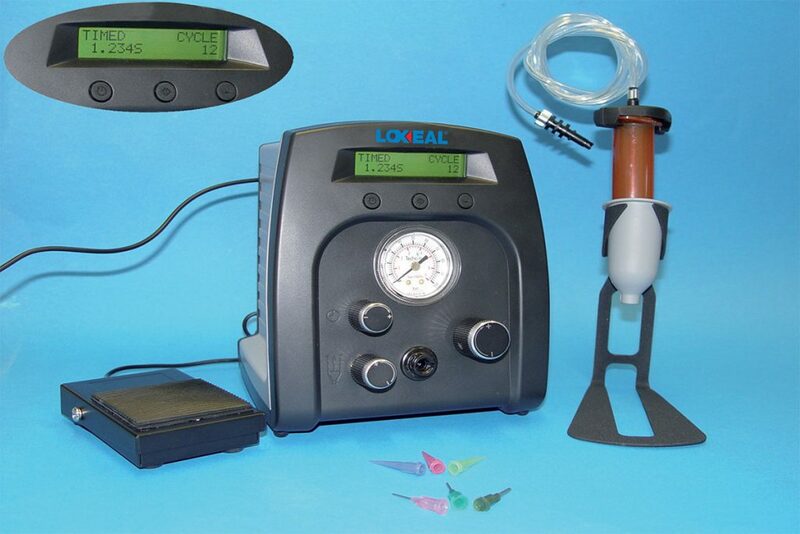 Dosing Systems | Loxeal S.r.l. Loxeal Dosing Systems are designed to fulfil customer’s dispensing needs, they are specifically thought for our adhesives range. Electro Pneumatic Dosing Unit (time-pressure) for anaerobic and cyanoacrylate adhesives. Including control unit, reservoir (with empty level sensor), valve, dosing nozzle, actuated by foot switch or metal part sensor. Suitable for PLC connections, equipped with end cycle alarm sensor. Tubing is made by PE and PTFE flexible hoses. Pneumatic Dosing Unit for manual dispensing of anaerobic and cyanoacrylate adhesives. Equipped with foot switch or hand actuated dispensing valve. Does not require electrical power supply and is suitable for use in spark proof / flame proof environments. Versatile Electro Pneumatic Dosing Unit suitable for low and high viscosity adhesives and lubricants. Dosing is effected by syringe acting as reservoir for products, may dispense even micro drops. A vacuum suction system avoid dripping from the dosing syringe.